WCLT - Nature Notes 3/15/2019 - Northern shrikes – songbirds or raptors? Northern shrike watching for prey from a perch. Songbird or raptor? “Both” might be one way of describing an uncommon visitor to our area from the north this winter, the northern shrike, a songbird famous for its carnivorous habits. At first glance, you might mistake a northern shrike (Lanius borealis, formerly Lanius excubitor) for a mockingbird. Both are about the size of a robin (about 9 inches long) and tend to hang out in similar areas, such as near the tops of bushes or in trees at the edges of an open field. Both are patterned in gray, black, and white (see photo). But if you catch sight of the bird’s falcon-like hooked bill, you’ll know it’s not a berry-eating mockingbird. It’s a meat-eating northern shrike. Yet unlike raptors (falcons, hawks, owls), northern shrikes don’t have talons (sharp nails on the toes), which raptors use for capturing and killing their prey. The shrike has a songbird’s feet. Northern shrikes breed in Alaska and far northern Canada, where they feed on the springtime abundance of insects, as many other birds do. There they prey primarily on large, relatively easy-to-capture grasshoppers, bumblebees, crickets, beetles, and spiders. They also take lemmings and birds. After the breeding season, some northern shrikes move south to southern Canada and the northern U.S. In winter when insects are scarce, they primarily hunt rodents (mice, voles, shrews) and birds, including birds that are as large as they are. This prey is harder to find and take down than insects, but larger. Northern shrikes use their hooked, notched bills to catch and kill rodents and insects. They capture birds with either their feet or bill. They typically hunt by perching motionlessly in a spot with a good view of the surroundings and then quickly swooping down on unsuspecting prey. They also sometimes hover in the air over a field to watch prey, as kestrels do. Northern shrikes are known for what they do with their prey once they’ve caught it. They don’t always eat it immediately. Instead, they might store it for future consumption by impaling it on a large thorn, sharp twig, or barbed wire. They’ll do this with mice, birds, frogs, and large insects such as grasshoppers. Or they might wedge their prey into a V-shaped fork of tree branches for safekeeping. You might find this a grisly practice, especially if you come upon impaled prey, but it’s the shrike’s way of making sure there’s something to eat if heavy snow or other conditions make it difficult to find fresh food. Northern shrikes don’t eat seeds or berries, as many of our winter birds do. Only about 15 percent of the northern shrike population winters in the U.S. Northern shrikes show up in our area only irregularly. Why do they appear in some years but not others? No one knows for sure, but it probably has to do with food shortages up north. Such shortages might be due to population cycles of rodents such as lemmings, weather, and/or competition from other northern shrikes. Does this predatory songbird sing? Both males and females sing year-round, but mainly in the breeding season up north. The song is variable and both musical and raspy, and calls are harsh. Outside of the breeding season, these birds are loners. Northern shrikes are native to North American and Siberia. They’re related to vireos, and to jays and crows. Another shrike, the loggerhead shrike (Lanius ludivicianus), lives in the southern and western U.S. and Mexico. It, too, impales its prey for storage. 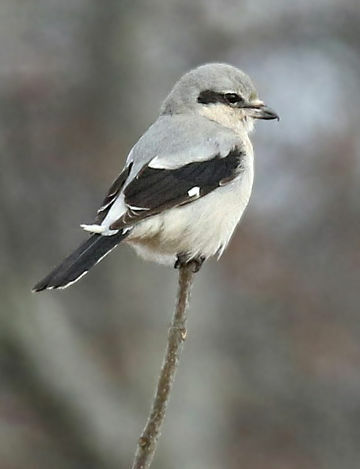 Loggerhead shrikes rarely venture as far north as Massachusetts.